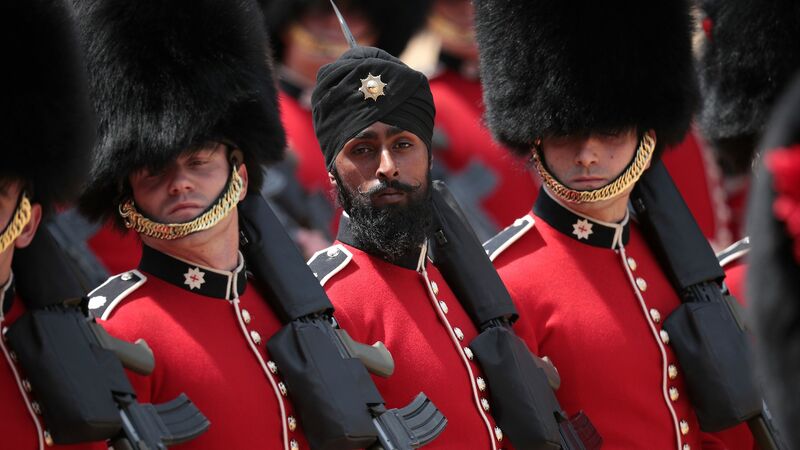 History was made at the Queen's Trooping the Color ceremony Saturday, that marks the Queen's official birthday, as Charanpreet Singh Lall, a 22-year-old Sikh, wore a black turban, rather than the iconic British Foot Guard bearskin hat, reports CBS News. This marked the first time a member of the Coldstream Guards wore the headdress that is traditional in Muslim and Sikh cultures during such event. "I hope that people watching, that they will just acknowledge it and that they will look at it as a new change in history... I hope that more people like me, not just Sikhs but from other religions and different backgrounds, that they will be encouraged to join the Army."